Joseph Schooling was just one of several Singaporean athletes were reaped multiple medals in Kuala Lumpur this week. Vietnamese swimmer Nguyen Thi Anh Vien continues her gold medal-winning siege, while a new face took the men’s splash n’ dash title in Kuala Lumpur. Thailand’s Nuttapong Ketin has had his doping suspension reduced from 4 years to 2, allowing him to swim in this week’s Southeast Asian Games in Kuala Lumpur. Olympic champion Joseph Schooling of Singapore collected his 3rd gold of the 2017 SEA Games, while a trio of siblings – Quah Zheng Wen, Quah Jing Wen and Quah Ting Wen – all earned gold as well. Singapore continued to demonstrate its prowess in the pool with top guns Joseph Schooling and Quah Zheng Wen each collecting multiple golds on day 4. Schooling is on his way to sweeping his events, just as he did at the 2015 edition of the SEA Games when he won 9 golds. This year, the 22-year-old Olympic champion has scaled back to just 6 events, but Schooling is making the most of every appearance. 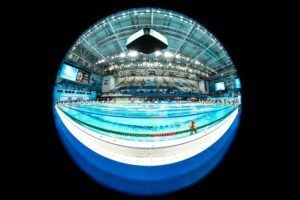 After handily winning the men’s 50m butterfly and 100m butterfly individual events earlier in the meet, Schooling took on the men’s 100m freestyle field tonight in Kuala Lumpur. 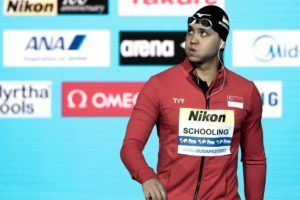 Clocking a time of 48.93, Schooling earned the only sub-49 second time of the field to successfully defend his SEA Games title and beat runner-up Hoang Quy Phuoc of Vietnam by almost half a second. Phuoc touched in 49.31 for silver, while Schooling’s teammate, Darren Lim, finished in 50.56 for bronze. Schooling’s 2nd gold of the night came in the form of his being a member of the Singaporean men’s 4x200m freestyle relay. Joining teammates Danny Yeo, Quah Zheng Wen and Pang Sheng Jun, the men collectively clocked a winning time of 7:18.94 to take gold for the 3rd consecutive SEA Games. Note – individual splits were not available at time of original publishing. Quah Zheng Wen had already won the men’s 100m backstroke earlier in the session, topping the podium in 54.81. Along with the relay, that makes 5 gold medals for the 20-year-old Cal swimmer with 2 more days of competition remaining. The men’s 200m IM saw Triady Fauzi Sidiq of Indonesia bag the win, clocking a time of 2:01.72 to represent the only swimmer under the 2:02 mark. That time surpasses his own national record and previous personal best of 2:02.05 set at the 2014 Southeast Asian Championships. Singapore’s Pang Sheng Jun was tonight’s silver medalist in 2:02.06, while Vietnam’s Le Nguyen Paul collected bronze in 2:03.39. For the women, Vietnam’s Nguyen Thi Anh Vien continued to wreak havoc across her events, adding more gold to her already bountiful collection so far at this year’s meet. She first took the women’s 200m IM in a time of 2:14.25 to earn gold, then she dominated the 800m freestyle, taking the title in a time of 8:35.55. That makes 6 medals for Vien Nguyen, with 5 of them gold. Coming in 2nd in that women’s 200m IM was Singapore’s Samantha Yeo, who touched in 2:16.85. With her silver medal-garnering performance, Yeo registered a new national record in the event, shaving just .01 off of Joscelin Yeo’s time of 2:16.86 from 2004. Yeo earned another silver tonight, finishing behind defending title owner Phee Jinq En of Malaysia in the 100m breaststroke. Jinq En won gold again this year in 1:09.00, while Yeo finished in 1:09.44 for silver. With her performance, however, Yeo earned her 2nd national record of the night, overtaking the previous Singaporean mark of 1:10.15 set by Nicolette Teo in 2007. 6 for 6 is expected considering he’s not swimming his most vulnerable races….200 fly and 200 IM. He won these races in 2015. He is not in his 2015 and 2016 shape. We found this out at NCAAs and Worlds. 1:48.88 is decent considering the fact he seldom swim 200m free.